The NCO Club is open to all members of the military. Come to the Fort Jackson NCO Club and enjoy a HOT DELICIOUS full breakfast buffet, every Thursday from 6:30 to 9:00 a.m., price: Adult $7/Children $5. Featuring a full array of breakfast items including a waffle station, full beverage station and the best coffee in town! In the NCO Club Dinning Room. Look forward to seeing you there! Lunch open Monday - Friday 11:00 a.m. - 1:30 p.m., $9.00 per person, $9.25 for to-go meal. Come and join us for a wide variety and different choices everyday on our lunch menu. Featuring all your favorites including our heart healthy options plus a full salad and dessert bar. Don't pass up our Southern Style Fried Chicken! The club offers a variety of delicious food, refreshing beverages and great entertainment. Dining room programs includes a lunch buffets 5 days a week with many of your favorite foods, and a Basic Training Graduation Dinner on Wednesday that will please even the most demanding taste buds. 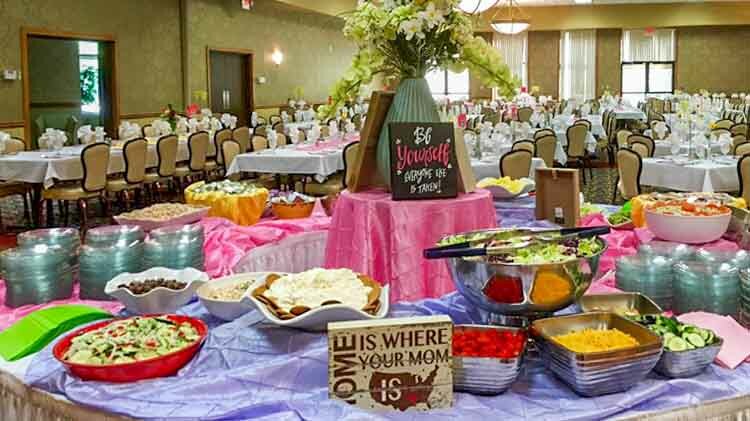 We also feature superb holiday buffets for Easter and Mother's Day. The NCO Club features over 10,000 sq. ft., built-in stage, dance floor, and seating for up to 550 guests in the ballroom; smaller rooms are available. With an elegant atmosphere, and highest quality selection of food, the NCO Club is the perfect place for your gathering. We can customize a menu for you. Our banquet rooms are ideal for your special day. The NCO Club has a full-service professional waiter staff ready to make your celebration perfect! Wedding receptions, anniversaries, holiday, birthday, and retirement parties. Also fashion shows, family and high school reunions, club and business meetings, church functions and military balls.